Martha Wrap: In a Store Near You! 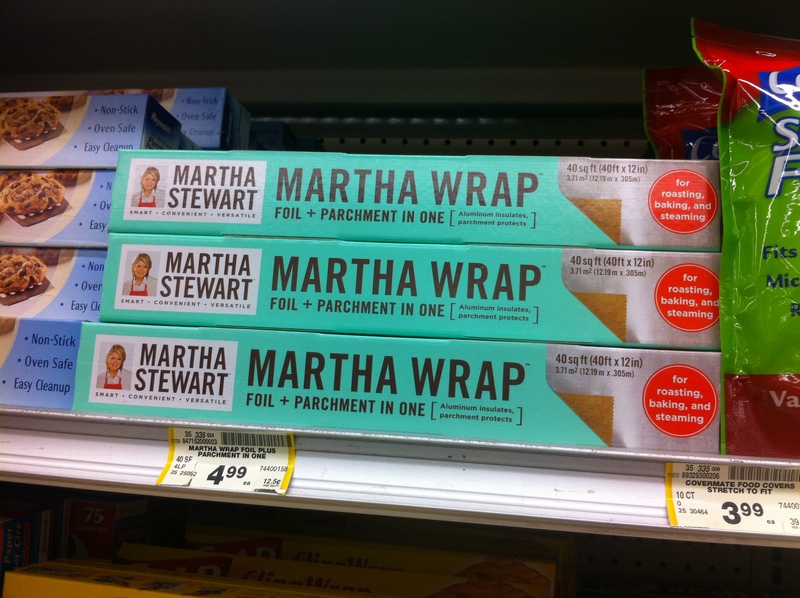 So excited to find this in the Safeway store near my home: MARTHA WRAP! Martha developed this idea herself: A 2-ply wrap that is foil and parchment. Ingenious, right? There are many ways to use Martha Wrap, and Team Martha has even created a nifty guide that includes ideas and recipes–that you can download here. Of course, I’ve purchased and will post photos of cooking results in an upcoming “Inspired by Martha” posting. If you’ve used Martha Wrap, send me a photo and I’ll post here for others to see. FOMs: Is there anything our beloved Martha cannot do? Answer: NO! Martha Stewart now brings her high standards of quality to your grocer’s aisle. First to arrive is Martha Wrap™, aluminum foil and parchment paper in one handy roll. Conceived personally by Martha, this kitchen helper makes roasting, baking, and steaming easy. When you see the Martha Stewart brand, you know it’s a product you can trust.